News: the winners of the 2013 Smithsonian Cooper-Hewitt National Design Awards have been announced, with Chicago-based collective Studio Gang Architects taking the prize for architecture. The annual awards, now in their fourteenth year, are given by the Smithsonian Cooper-Hewitt, National Design Museum in New York in recognition of lasting achievement in American design. Jeanne Gang, founder of Studio Gang Architects, a Chicago-based collective of architects, designers and theorists, was presented with the Architecture Design award. 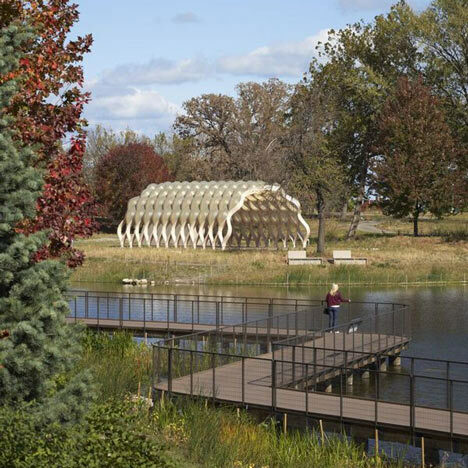 Studio Gang's projects include the transformation of a pond in Chicago's Lincoln Park Zoo into an ecological habitat (pictured top). James Wines, founder and president of New York-based architecture studio SITE, was awarded the Lifetime Achievement prize for his work on environmentally-conscious buildings, interiors and public spaces. The Corporate & Institutional Achievement award was given to TED, the nonprofit organisation whose online TED Talks on topics ranging from augmented reality to how to tie shoelaces surpassed one billion views in 2012. Architect and urbanist Michael Sorkin picked up the Design Mind award, while the Graphic Design prize was given to Paula Scher, a principal at design consultancy Pentagram, whose work includes the typographical decoration on the facade of the New Jersey Performing Arts Center. The Fashion Design award was won by Behnaz Sarafpour, who has collaborated with Target, Lancôme and Earnest Sewn and had her clothes exhibited at the V&A in London and the Fashion Institute of Technology's museum in New York. Joshua Aidlin and David Darling of Aidlin Darling Design won in the Interior Design category, while media design firm Local Projects, which specialises in work for museums and public spaces, took the Interaction Design prize. Margie Ruddick won the Landscape Architecture award for her work on projects including New York's Queens Plaza and Trenton Capital Park on the Delaware River, while NewDealDesign, a San Francisco studio whose work includes the Fitbit wearable activity tracker, picked up the Product Design award. Last year's National Design Awards included prizes for architect and graphic designer Richard Saul Wurman and product designer Scott Wilson, who came up with the Luna Tik kit that converts an iPod Nano into a touch-screen watch.